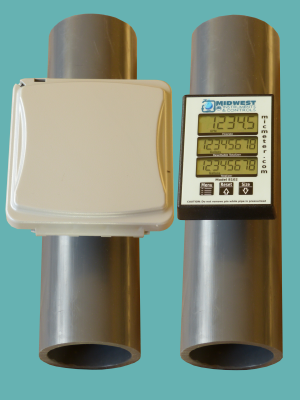 Pipe mounted flow meter supplied with a 13″ long section of 2″ schedule 80 PVC pipe. Meter on left has Sunshade installed. Shade lid flips down to view the meter. The plug, listed below, allows the flow to be restored while the meter is removed for cleaning or servicing. Fast and Free Shipping. 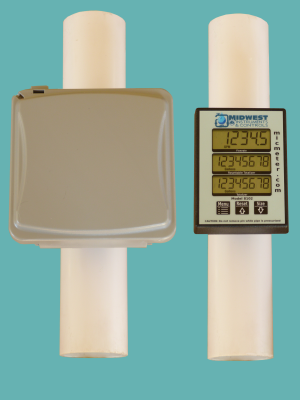 Standard pipe mounted flow meter supplied with a 13″ long section of 2″ schedule 80 PVC pipe. The flow rate range for this meter is 15 GPM up to 200 GPM. The display can be rotated relative to the pipe to allow easy viewing on both horizontal and vertical mounts. Pressure not to exceed 150 psi. Battery Life greater than 5 years. The plug allows the meter to be removed and then the water flow restored. Allows for cleaning and servicing of the meter. One size plug fits all of the adapters. Fast and Free Shipping. 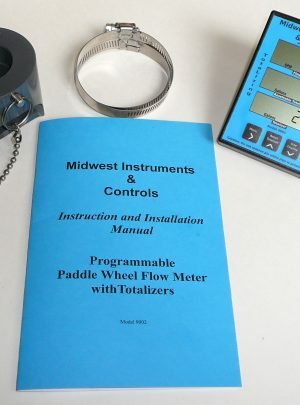 Pipe Mounted Meter supplied with a Strap-On Adapter for 2″ Schedule 80 PVC pipe. 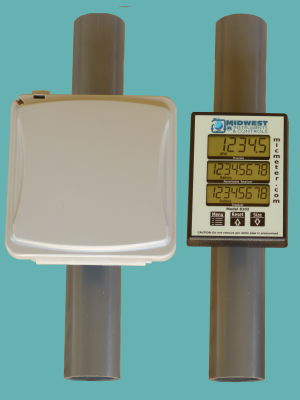 Pipe mounted flow meter supplied with a 13″ long section of 2″ schedule 40 PVC pipe. Meter on left has Sunshade installed. Shade lid flips down to view the meter. The plug, listed below, allows the flow to be restored while the meter is removed for cleaning or servicing. Fast and Free Shipping. 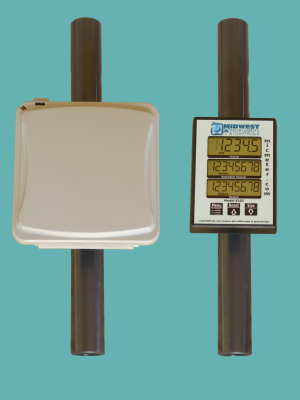 Pipe mounted flow meter supplied with a 13″ long section of 1″ schedule 80 PVC pipe. Meter on left has Sunshade installed. Shade lid flips down to view the meter. The plug, listed below, allows the flow to be restored while the meter is removed for cleaning or servicing. Fast and Free Shipping. 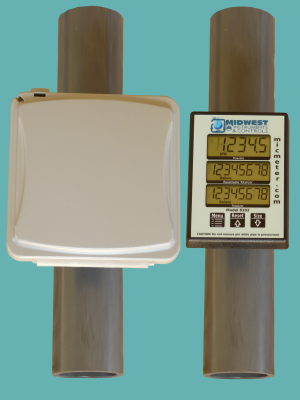 Pipe mounted flow meter supplied with a 13″ long section of 4″ schedule 80 PVC pipe. Meter on left has Sunshade installed. Shade lid flips down to view the meter. The plug, listed below, allows the flow to be restored while the meter is removed for cleaning or servicing. Fast and Free Shipping. 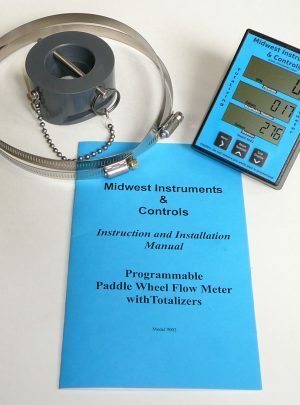 Pipe mounted flow meter with a Strap-On adapter for 6″ schedule 40 pipe. 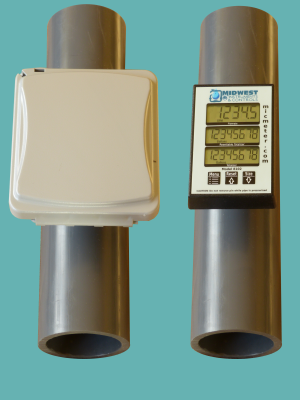 Pipe mounted flow meter supplied with a 13″ long section of 1.5″ schedule 80 PVC pipe. Meter on left has Sunshade installed. Shade lid flips down to view the meter. The plug, listed below, allows the flow to be restored while the meter is removed for cleaning or servicing. Fast and Free Shipping. 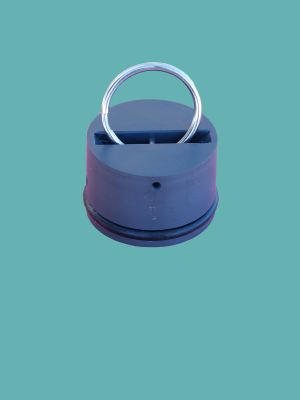 Pipe mounted flow meter supplied with a 13″ long section of 3″ schedule 80 PVC pipe. Meter on left has Sunshade installed. Shade lid flips down to view the meter. The plug, listed below, allows the flow to be restored while the meter is removed for cleaning or servicing. Fast and Free Shipping. 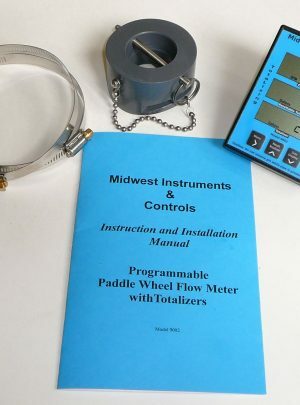 Pipe Mounted Meter with a Strap-On Adapter for 4″ Schedule 40 PVC pipe.